Hats off to my Sikh brother n sisters once again..they never fail to seize any opportunity to help people as if they are only made for true humanity…Hot fresh food is being prepared at the Chennai Gurudwara for the needy and homeless. Please get in touch if u need food for a certain area we will be happy to provide. Food packets will be distributed across the city all day long !! Call on 9094790989. Its time to give back to the country and help each other as a family. Peace !! Chennai is a low-lying flood plain area, almost like a chapati, rises slightly as the distance from the sea-shore increases but the average elevation of the city is not more than 6.6 m above sea level, while most of the localities are just at sea-level and drainage in such areas remains a serious problem. Apart from plain terrain lacking natural gradient for free run-off, the sewage system was originally designed for about just over half a million population. Later it was modified during 1989-91 even then it has not reached the required capacity. Experts point out the Second Master Plan by the Chennai Metropolitan Development Authority has paid no attention to hydrology and stormwater management. In Chennai, 650 water bodies, which include lakes, ponds, and storage tanks, have been eliminated to accomodate new construction.. Today, sadly, there are just 27 water bodies in Chennai. Chennai has only 850 km of storm drains for the 2,850 km of roads. There is no storage infrastructure to harvest the rain water in Chennai. Chennai is drained by Cooum River and Adyar River in addition to many major and minor drainage channels through Buckingham Canal to Sea. It is only once is ten years that Chennai gets enough rain to flood the city. The rest of time, people pray for rain as ground water levels deplete and water trucks deliver water to apartment complexes, villas and tenements. But last week it was different. 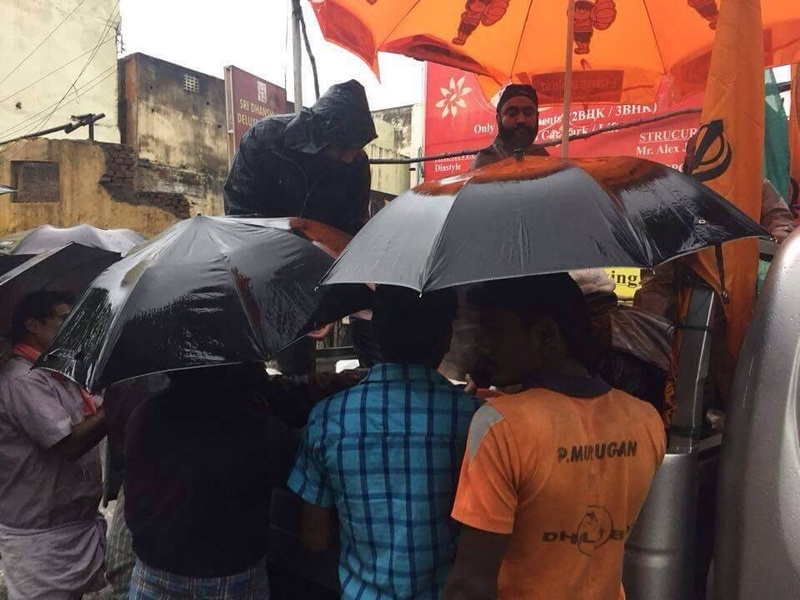 In the first 24 hours Chennai received 250 mm of rainfall. In 1976, Chennai saw a record 450 mm of rainfall in a single day, almost twice what the highest rainfall was this year in a day. The year 2005 Chennai received more than 250 mm rainfall in 24 hours. Several years ago, at seminars, Stormwater Management Experts pontificated of the dangers of building the Mass Rapid Transit System on the Buckingham Canal, of constructions on the Pallikaranai marshlands and of locating the Information Technology corridor on a water body. But the constructions continued nevertheless. Gated communities as well as special economic zones have come up in areas which should have been catchments areas. Temple tanks which refueled the ground water through centuries have been concreted. Tenements and apartment complexes have come up on the flood plains of the rivers. The unique eco system with mangroves and intertidal zones will all be a thing of the past. A disastrous cocktail of sewerage and rain water entered homes bringing with it promises of deadly disease, snakes and scorpions. In many parts of South Chennai, the water was almost 1.5 m in depth, especially those which have been constructed on marshes and swamps. The main cause for the flooding has been the blatant disregard for ecology by the caucus of politicians, civil servants and developers. Due to dumping of garbage and massive reclamation, marshland especially in south Chennai has reduced to one-tenth of its size. Swamps and wet lands such as Pallikaranai have been reclaimed to accommodate high rise buildings. The case in point is of Tharamani and Velachery, two areas which are waterlogged in the event of rain. Phoenix Mall, the largest mall in Chennai, is on a lake bed in Velachery. Tamil Nadu government has built a slum resettlement colony along the river channel and multi-storeyed housing estates have come up which blocks the natural drainage of river basin into the sea. The original silting pattern was shifted due to the development. Sewage and industrial effluent dumped into the Buckingham canal and silting have left the waterway stagnant. Chennai is built on a floodplain, development has essentially gone unchecked: Chennai’s critical infrastructure—like the airport, automobile manufacturing plants, and IT centers as well as thousands of houses—has been built over streams and marshes, and plastic bags clog drainage networks. Chennai’s infrastructure has strained to keep up with the rapid growth. Due to this, the surface run-off is too high and the infiltration capacity of land has gone down drastically. Due to the increase in impervious areas and lack of proper storm drainage, Chennai will experience severe floods during every heavy rainfall. And yet, Chennai is continue to build recklessly on lake-beds and river-beds.